Luang Pu Thuat was born 1582 in Suan Chan Village, Chumphol Dustrict, Sathing Phra in Songkla (Southern Thailand). His parent were Mr. Hu and Mdm. Chan, a poor couple living in the place of Shrentthi Pan, the wealthy landlord. His parents name their child as PU(meaning crab). One day his parent took PU (still a new born baby) out to the rice field and before going to the field the made a cradle by hanging a cloth between two trees for the child to sleep in. After sometime out in the field working, Chan turned around to check out her baby and to her surprise she saw a large snake curled up around the child cradle. Chan cried loudly in fright and those in the distance as well as Hu quickly rush to check out what was happening. They found out that a snake had curled up around their baby and was observed by others. To their surprise, the snake did not harm their child. With the old belief that this snake might be the Buddha created vision, they prayed to the snake and offered flowers and rice cake. The snake then uncurl itself, spit out a Crystal Translucent Gem and left the child. In astonishment, the baby was still asleep with a crystal gem that emits rainbow colors beside his neck. The crystal gem was properly kept and given back to PU when he was grown up. Even today, the crystal ball is still installed as Wat Phra Kho in Songkla with many stories of its miracles.When PU was seven years old, he was send to stay with Abbot Chuang, his Bikkhu uncle, at Wat Kudi Luang and further his primary school studies there. Then at 15 he was ordained as a novice monk and lived with Phra Khru Saddhammarangsi at Wat Sri Ku-Yang (at present in Ranod, Songkla). At the age of 20, he was ordained as a monk by same as his preceptor. Samiramo the Buddhist name (Chaya) was given to the new monk. Three years of his monkhood under the guidance of Phra Khru Ka Derm, he studied Dhamma and Pali Language till its basic introductory is completed. Later on, he wanted to further his studies of Buddhist scriptures in Ayudhya. After obtaining permission to leave from his preceptor, accompanied by Mr. Inn the passenger ship owner and they left for Ayudhya. Three days after sailing off the open sea, suddenly storm and rough sea starts to rock the boat. The boat had to be anchored till the sea becomes calm before proceeding with their journey again. During this hard times, they had consumes all of the fresh water as well as foods. Out of anger and frustration, other passengers on board including the owner vented their anger by blaming and cursing Bikkhu PU and exclaimed that he had brought to them bad luck and wanted to expel him down from the ship. Then Bikkhu PU rose and others look on, he dipped his foot into the sea to draw a circle. Then he told the sailor to fetch fresh drinking water from the sea from where he had circled with his feet. The sailor then perform what was told and tasted the water himself, after satisfying his doubts and found to be drinkable like normal fresh water. Soon after sufficient fresh water were collected and stored for the rest of the journey, they proceed with their interrupted journey. After realizing the ability of Bikkhu PU, all on board kneeled down to beg their pardon from him, and the owner invited him to use the boat again on his next trip. When arrived to Ayudhya, Mr. In took Bikkhu PU to reside in Wat Khae and offered Nai Chan, his servant to follow Bikkhu PU as his close assistant. After business is done by Mr. In, he left and sailed back to where he had came from. In Ayudhya while Bhikkhu PU had studied Buddhist scriptures at Wat Lumbalinavas. During that time the King of Sri Lanka are challenging with the King of Siam to translate all of the golden alphabets into the Buddhist Scriptures to the correct order within seven days. If all the requested be met and finished in time, the King of Sri Lanka would then give all of the treasures transported in seven boats to the King of Siam as prize. Otherwise the King of Siam will have to pay to the king of Sri Lanka he failed. The King then summoned those learned monks and persons within the capital city a Ayudhya, no one could meet with this challenge. Six days of anxiety of the King had passed. At last it was known that a young Bhikkhu named PU or Samiramo with great abilities, and was summoned to translate all of the golden alphabets into the Buddhist Scriptures to the correct order. The young monk went to the assembly, paying his respect to Maha Sangha and King, then encountered with seven Brahmins from Sri Lanka. Bhikkhu PU started to rearrange the golden seeds into the Dhamma according to Buddhist texts with no difficulties. The 84,000 units of the golden seeds were all used up except seven seeds left missing. They were Sarn (Dhamma-sangani), Vi (Vibhanga), Dha (Dhatukotha), Pu (PUggala-pannatti), Ka (Kathavatthu), Ya (Yamaka) and Pa (Patthana) which are the heart of the seven scriptures of Abhidhamma Pitako. The young monk turned to the seven Brahmins and asked if they had kept the missing golden seeds. When they were given, the complete rearrangement of golden seeds into Buddhist scripture of Abhidhamma was finished on the 7th day, the Brahmins as the Ambassadors of King Sri Lanka had then given all the treasures of 7 boats to the young monk but he turned everything away and gave them all to the King. Being favorite to King Ekadasaroth of Ayudhya with his knowledge and wisdom, Bhikkhu PU had been bestowed upon the Sangha title of "Somdej Phra Rajamuni Samiramagunupamacarya" the most higher rank ever given to any other wondering monk before in the country. 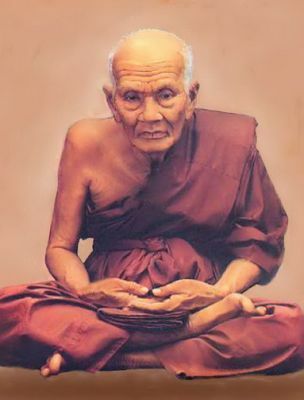 Somdej Phra Rajamuni Samiramagunupamacarya or Luang Pu Thuat had stayed in Ayudhya to have advised to the King many ways till his old age and then asked for permission from the King to go back his home town. The King had permitted with a promise to give all the supports requested by Luang Pu Thuat in turns of his virtuous deeds. When Luang Pu Thuat was back to Wat Phra Khoh, he found the Wat mostly ruined and thus sent a message requesting the support to restore the temple to the King. King Ekadasaroth was pleased to respond to Luang Pu Thuat needs, he gave all supports to the said monastery and graciously issued the Royal Degree on Dedication of Land and People of about 250 families nearby Wat Phra Khoh as beneficial temple. The Royal Decree was later successive to Wat Khian possession and given to prince Damrong Rajanubhab in 1913. At present the document was kept in the National Library in Bangkok. 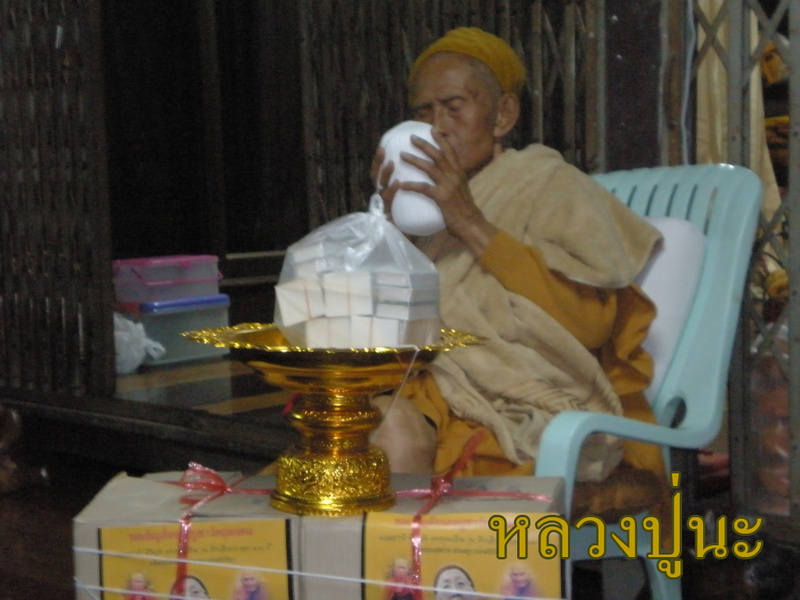 Luang Pu Thuat had spent his life spreading the Dhamma for benefiting the people without impartiality. Lastly, he took leave from Wat Phra Khoh along with a young novice to preach Dhamma and helped people at various places in the South up to Malaysia, Singapore and Sri Lanka. His second permanent residence was at Wat Changhai, Pattani. His date of passing away was not certain. Through his supernatural power and miraculous virtues, Luang Pu Thuat manifest through vision and dream seeking to produce the first amulet of him initiated in Wat Changhai 1954. 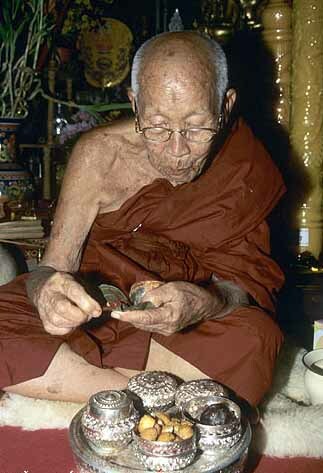 Amulets of Luang Pu Thuat have shown many miracles to individuals carrying it. From there onwards, many batches of his amulet pendants were produced. The popular one&#8217;s have been documented in the book titled "Luang Pu Thuat: The Story of His Life and Amulets". Luong Pu Thuat became famous during the 16th century when he saved the people from draught. There was at that time, not enough drinking water, and the weather deteriorate day after day. According to an account related by villagers, a monk was sighted in a small boat which moving along the river. He was in deep meditation and prayer. After he&#8217;d finished chanting, he lowered one of his leg into the river, and within short while, the river is filled with clear, clean drinking water. A miracle had happened. This bit of good news spread throughout the province and to other parts of Thailand. The monk was no other than Luong Pu Thuat himself. The people highly respected and graciously revered him from then on. -Kruba Srivichai (B.E.2421~2481) was ordained as novice monk under Kruba Kadtiya and he learnt everything under his teacher. One day, one villager gave some meat to Kruba Srivichai. After he consumed, he vomitted and fell ill. Since then, everytime he consumed meat, he would vomits and falls ill. Hence, Kruba Srivichai became a vegatarian and stopped eating meat. At B.E.2427, Kruba Srivichai helped Kruba Kadtiya to build a temple at Ban Pang. When Kruba Kadtiya passed away, Kruba Srivichai became the abbot of the temple. Kruba Srivichai observed a very disciplined rountine daily. He woke up at 5am to sweep the temple's compound, then he would performs chanting and after which, he would go for alms in the village. In the afternoon, he would teaches the villagers, novice monks and children on Buddha's teachings. In the evening, he would performs chanting again and practice Sammadhi. He stayed in the temple and hardly left the temple. Kruba Srivichai became very thin because he stopped consuming meat. The villagers seeing that, respected him and offered him many expensive gifts but Kruba Srivichai just passed the gifts to the poorer villagers. He was contented with a meal of small lump of rice with little vegetables each day. Kruba Srivichai has been called the 'Engineer Monk' because he mounted and supervised over one hundred construction projects in northern Thailand, including many temples. He had organized the building of a road leading to Wat Prathat Doi Suthep, the grandiose temple complex that sits on a mountain top overlooking the city of Chiang Mai. The road went under construction in B.E.2477. At that time, only the strong and devoted made the minimum five hours hike up the mountain to Doi Suthep through dense tropical forest. At that time, the government could not raised sufficient money to build the road, so they called upon Kruba Srivichai to help. He sent words far and wide, and because of his great popularity, volunteers came from all over Thailand to lend a hand to the effort. It was said that as many as 3,000 to 4,000 people a day came to build the road, which was originally paved in stone. complete 50 feet of road was decreased to 10-15 feet. Day by day, a massive volunteer workforce cleared the area and set stones on the roadway. The road was completed in 5 months and 20 days. Kruba Srivichai was the first to inaugurate the opening of the road on 30 April, B.E.2478. 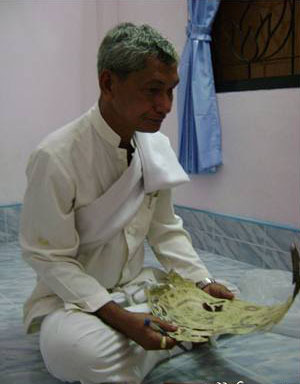 Kruba Srivichai passed away in B.E.2481 at the age of 60 and he was given the title "Nak Bun Haeng Lanna", which may be translated as The Lanna Saint. 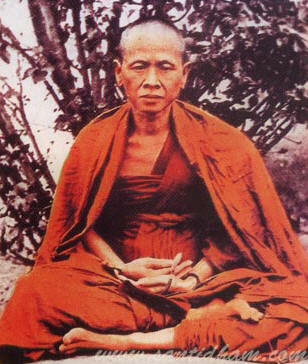 KRUBA DUANG DEE WAS THE LAST GENERATION OF KRUBA SRIVICHAI’S DISCIPLES. 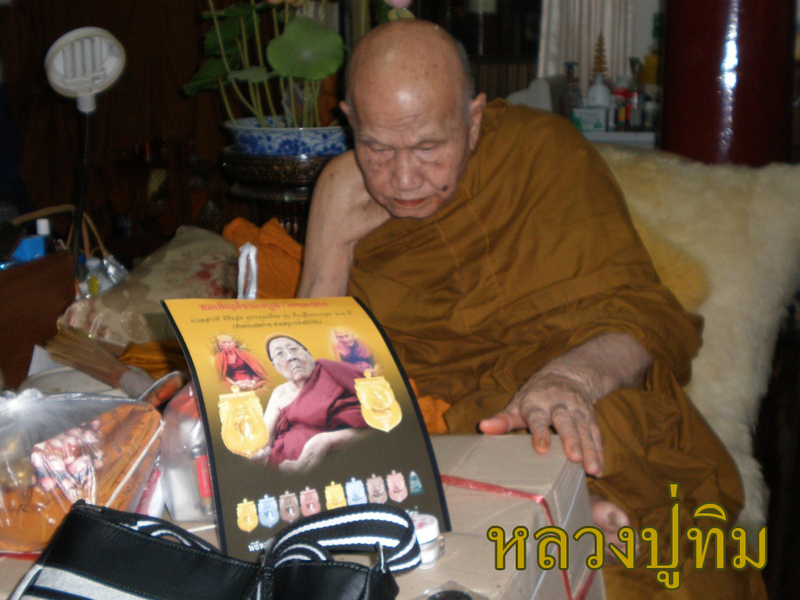 HE SPEND 83 YEARS IN MONKHOOD BEFORE HE PASSED AWAY 2 YEARS AGO (B.E. 2553) AT AN AGE OF 104 YEARS OLD. BUT KRUBA DUANG DEE IS FAR FROM FORGOTTEN. 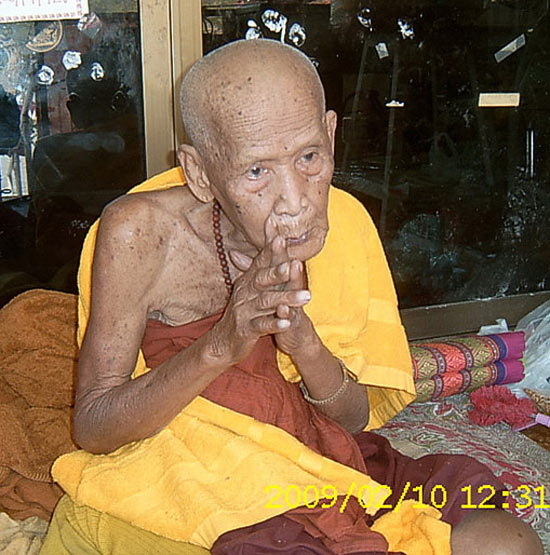 HIS CHARISMA, KINDNESS AND GREAT DHARMA PRACTICE ARE STILL ALIVE IN THAIPEOPLES HEARTS. HE WAS ABBOT AT WAT THA JAMPEE IN SANPATONG AND THE 6 TH OF FEBRUARY I WENT TO THE TEMPLE TO HONNOR THIS LEGENDARY MONK ON HIS DEATHDAY. ในวันเสาร์ ที่27ธันวาคม 2551เวลา 19.09 น.- 24.00 น. According to the book "Pathomsompothkata" by SomdejPhramahasamanajaogrom Phrapalamanuchit Chinoroth (The 7th PhraSunkararth leader of thailand monk coucil of Thailand Jakri dynasty) It was the prediction of Buddha said that when the Buddhist era has pass for 218 years. There will be one monk name Aupakuith who destroy an evil. The legend said of the King Sridhumasokararth who want to gather all Buddha relic to place at Relic Pagoda altar he have builded 84,000 place all over india. The big ceremony will take 7 years 7 month 7 days. The king was worried that something bad misfortune will happen, then he asked the monk council to look into the matter and ready for this. 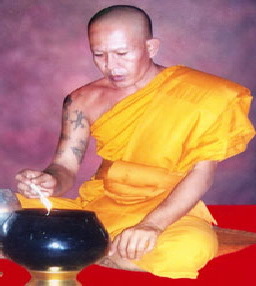 The junior monk then appear at the council and tell the senior to invite PhraAupakuith to the council for this matter. The king was in doubt that will he be good enough, he test him with the crazy elephant. Phra Aupakuith then use his spell to calm the elephant. With this test, the king have bow and pray to the monk. It is not welcome for evils and bad spirits when human and gods worship the relics. The evils try to destroy the ceremony with many kind of disaster. PhraAupakuith can fix the problem everytime. He chant the dog's head hang around the evils for 7 years 7 months 8 days until the ceremony finish which bring the shame to all evils. Thus later on these evils have listen to the Dharma teaching and pray that they'll become Buddha in future, PhraAupakuith then release them at later time. With the buddha's story and legend of god. Buddhism have builded image of PhraAupakuith for pray/worship and to protect from all dangers and misfortune or bad spirits. At present in many ceremony the monk will chant worhsip PhraAupakuith for protection and success in the ceremony and all kind of works. PhraAupakuith is an Arrahun enlightened monk who meditation at the castle in the middle of an ocean. Any sea man or sailor would pray to him for a safe fortune during travel oversea and anything relate to an ocean.